July 2, 2010 (RALEIGH, NC) – Tonic Design | Tonic Construction with Mike Cindric are recipients of a 2010 AIA Small Project Award for their Art As Shelter project. 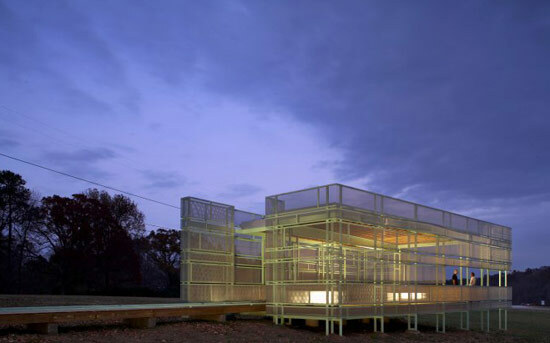 Cited by the SPP jury as “a remarkable piece of shelter and a handsome form in the landscape,“ this project was designed and built as an integral component of the North Carolina Museum of Art Park’s “art-in-service” projects program. ‘Art as Shelter’ offers visitors a sheltered place to sit and reflect upon the museum sculpture park and public greenway. The pavilion can be viewed as an object in the landscape or experienced from within, framing views of the sculptures, trail and the adjacent prairie. Large interior clear spans promote the use as an open-air classroom, a beautiful indoor/outdoor setting for teaching about art and nature. Docent-led student groups utilize the space as a studio; where folding tables, folding stools, and art-making materials are stored in frosted-acrylic clad boxes that double as benches and night time illumination. The metallic “skin” of the pavilion reflects its natural surroundings by taking on the colors of the grass and sky, or at times completely disappearing into a moiré pattern of light and shadow. Tonic Design and Tonic Construction, a design/build firm, has won several American Institute of Architect awards at the local, state, regional, and national levels, and has been featured in Dwell, Residential Architect, Custom Home, and Architectural Record magazines. “Art as Shelter” has been featured in MetalMag Architecture and has been a winner of an AIA award of merit and a Sir Walter Raleigh Award. For more information visit http://www.tonic-design.com.